Grilling the shrimp in this Grilled Shrimp Piccata adds a level of flavor that makes this dish amazing! It’s also amazingly on the table in a short time making this perfect for any night of the week. This has been on the burner for weeks now. I had the pictures taken, the meal was eaten, and I just needed to share it. But then November and December happened. HOLY smokes I have been busy in November and December!! Between the Wasa mac n cheese, #FreakyFriday cookie edition, Thanksgiving with Whole Foods and Williams Sonoma, #TastyParTEA, and #WeekdaySupper. Then there was hosting #SundaySupper not one, two, but THREE events in a row. Next it was #TeaProudly, #CranberryWeek, #12DaysofCookies, and #GetWellMichelle. AND FINALLY, the #FLStrawberry Sunday Supper! It’s been a roller coaster ride for the last two months! Then there’s the whole work thing. SO that wonderful software that we used to speed up our billing process from a month and a half to weeks is null. Our glorious DOS based software program was changed and the essential report we use vanished. So…yeah. I think I’ve had an anxiety attack every day since the Thanksgiving. I mean, to do the reports and billing by hand is NOT an option! 600+ reports, over 1500 bills is not something you can do manually. Then there’s the whole overhead allocation issue! GAH! I’m freaking out just thinking about it. Work has been difficult these past few months to say the least. Doing EVERYTHING manually is just NOT an option. Seriously. Just not. I mean, that will take us back to pre-1995 or so. I kid you not. All of this means that I have a little bit of a back log of recipes to share. Like this one. I can’t even remember how this came about, but I knew I wanted to do a grilled shrimp recipe. It was meant to be a carbonara I think, but then it just morphed into a piccata. Or maybe it was more of a grilled scampi? But we had capers just dying to be used. So…voila! Piccata! Honestly. I can’t remember. I just remember that this was delicious enough to share with ya’ll. And it comes together so easy and so quickly that you can make this any day of the week for your family. And it tastes AMAZING! 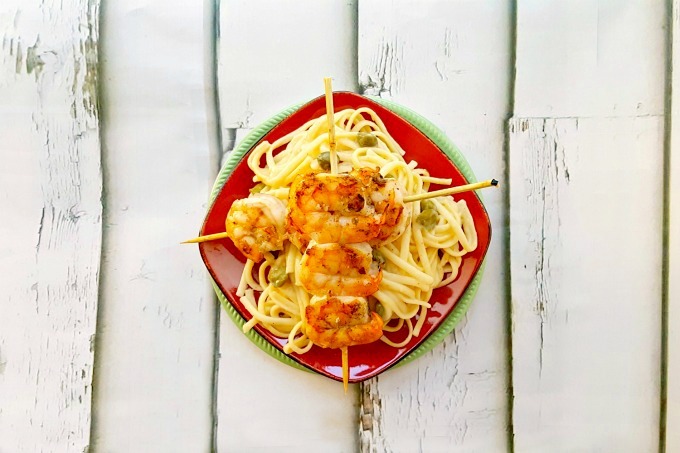 The sweet, grilled shrimp, the hearty pasta, and the delicious flavor from the lemons and capers make this an amazingly quick meal to serve your family. I realize that grilling season for some has already passed. You could be die-hards like us and just grill the shrimp anyway. It doesn’t take long to cook them up on our gas grill. If you don’t want to brave the cold temperatures, or don’t want to fire up your charcoal grill, then you could easily broil the shrimp instead. Or if you had one of those grill pans you could use that, too. You’ll just miss that flavor that grilling adds to this dish. You’ll just have to make sure to remake this dish when grilling season opens in your area. Because it is worth it to grill the shrimp. I have to admit, it does feel strange to be writing just for me and not an event or a sponsored post. But, I’m sure that will be short lived. #SundaySupper month is just around the corner and I know I’ll be participating in all of those events. Especially now that the hubs has been involved in some of the recent creations. I credit him for the strawberry salsa and the twice baked potato casserole. Those are totally his inventions. I just made them look pretty. He asked me to make a particular kind of cookie, but the white chocolate chips just sank and I couldn’t figure out why. I’ll share those photos at some point. It was strange. Do you grill year round? Or do you have a “season” where you grill in the warm months? Grilling the shrimp in this Grilled Shrimp Piccata adds a level of flavor that makes this dish amazing! It's also amazingly on the table in a short time making this perfect for any night of the week. Preheat a large skillet over medium-high heat. Add the garlic and spices. Saute, stirring occasionally. Thread the shrimp on skewers and sprinkle with salt and pepper. Grill on high 3 to 4 minutes per side or until cooking through. Add the lemon juice and white wine to the herb mixture. Add the cooked pasta and saute until the the wine has reduced by half. Stir in the capers. Divide the pasta evenly between 4 plates. Top with two skewers of shrimp and serve. It’s been a whirlwind for sure, but this looks delicious! Thanks for sharing! Thank you! It has been a whirlwind. I can’t wait for the next one to come along!